We are ecstatic to announce that the winner of our 2142stuart giveaway is lucky number 35! Congratulations Francesca! Thank you so much for participating everyone - we have another great giveaway today so stay tuned! For all of you who participated but didn't win, check out 2142stuart. Kate's shop has some awesome prints that'll help you get a little more homey and hip. I'm loving the bright colors and use of lettering (Me? Loving lettering? I'm sure you're shocked.) Kate has generously offered one of our readers an 8 x 10 or 11 x 14 print of their choice! Just love that "I LOVE U" poster... and she has a whole host of colors. And speaking of love, I'm crazy about these overlapping letters (and her weathered frame... sadly not included!). And how funky are these lovebirds? Check out Kate's Etsy shop for more of her work! Want to win a print for yourself? There are two ways! Many thanks to Kate for sharing her prints with us! Stay hip! This just made me snort with laughter. That little mini-bathroom in Melissa & my shared closet really could have used some sprucing up. I love the home sweet home love birds! There are also some really great prints in her other shop on etsy. I especially like the French advertisements. I am already a fan on facebook, happy friday! i have no idea why, but there's something about that blue diamond that i love. thanks so much for offering this! That abc/I love you print takes the cake. I am a sucker for simple pops of color like that. i like the do you realize rainbow print. flaming lips for the win! I like the Pink & Purple skies. 18"x24" Print. Original Polaroid Photograph Enlargement. I like the love me tender print. I like the 11x14 ABC Print. I love you. Alphabet Love. Typography Print. Gray and violet-pink. I love the "Love Layers" in mustard...so pretty! My favorite is the 8x10 Shining Blue Diamond print. I love "Do You Realize We're Floating in Space?" I like the Love Me Tender print in aqua. So cute! I already like Hardly Housewives on Facebook. I love the 11x14 ABC Print. I love you. 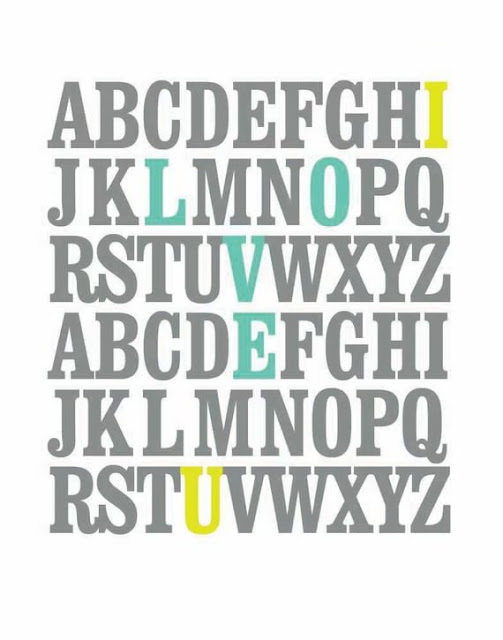 Alphabet Love. Typography Print. Seafoam and Yellow, thanks! My favorite item from 2142stuart is the 11x14 Home Sweet Home Watercolor Painting Print. Liked Hardly Housewives on FB! I really like I Love U print, any color would work for me! I love "ABC Print. I love you. Alphabet Love. Typography Watercolor Print." The bright colors are beautiful. I follow Hardly Housewives on Facebook as D'Aundra Wallace.